Kun pari päivää ennen hääjuhlaa talkooporukalla pystytimme ei-ihan-mitä-tahansa hääjuhlia helteen kypsyttäminä, alkoi hymy itse kunkin naamalla muistuttaa lähinnä irvistystä. Kunnes hääpaikalle saapui matkalaukullinen sateenkaarenväristä lippusiimaa Englannista! Tässä lippusiiman tarina tekijänsä Lucy Denhamin kertomana. Entinen kollegani Lucy hurahti lippusiimaharrastukseen saatuaan ensimmäisen lapsensa. Edes vanha, takkuileva ja temppuileva ompelukone ei ole onnistunut pysäyttämään tätä kätevää emäntää. There’s something very relaxing in the mundanity of drawing triangles on fabric, cutting out triangles and sewing up triangles. There’s a rhythm, there’s familiarity, there’s satisfaction in the ever expanding piles of colourful fabric and the over-flowing bin full of pretty scraps of fabric. 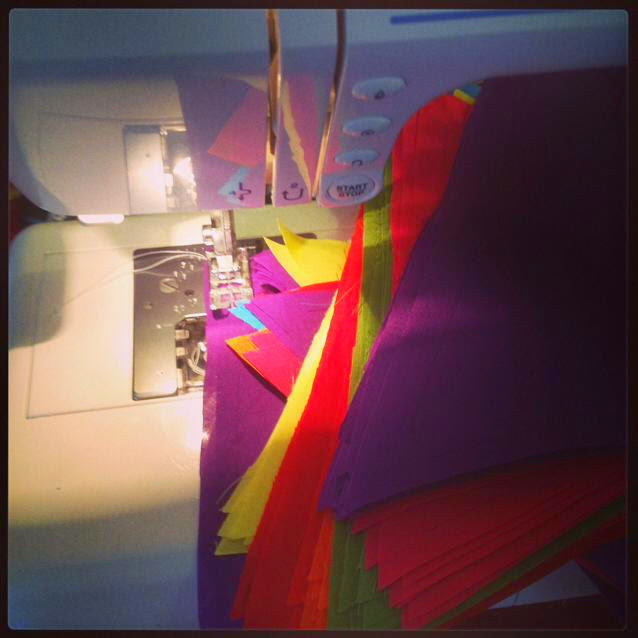 Those are all part of the reason why I started making bunting. Bunting for friends’ babies initially, bunting to hang on our stairs at Christmas, and bunting as an excuse to buy pretty fabric to stash in my colour-coded fabric cupboard. You see I do have a slight over-whelming desire to buy pretty fabric all the time. 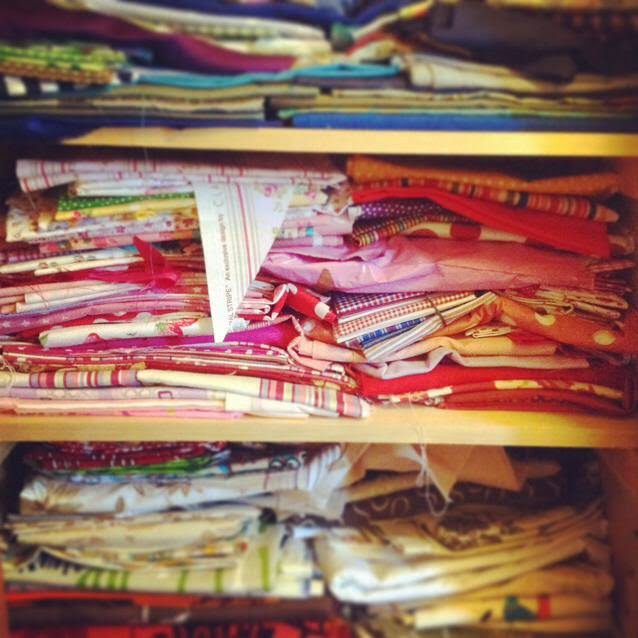 Not the worst hobby in the world, but making the fabric into something to give to other people does mean our little semi-detached house isn’t worthy of a channel 4 documentary into excessive hoarding! Well just! 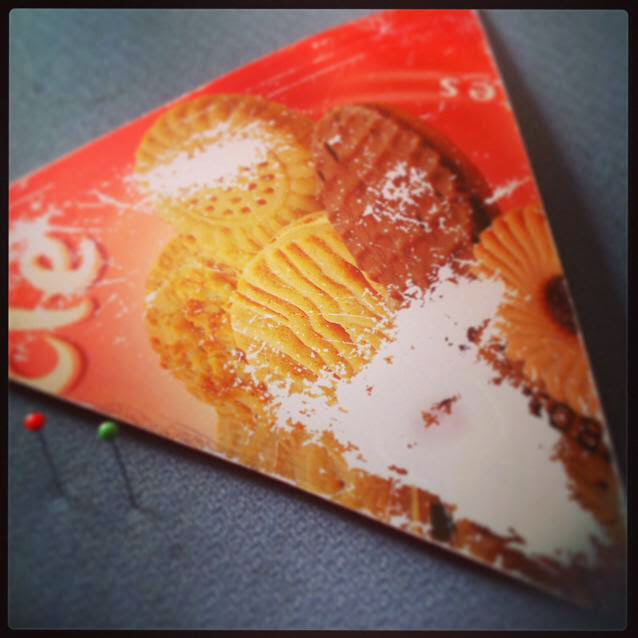 The trusty old triangle template – made out of a biscuit lid! So here I am with little molehills of rainbow-coloured fabric triangles around me. And a dicky sewing machine that’s developed an intermittent fault, probably down to the excessive use of recent times, whereby it either doesn’t stop sewing even after taking my foot off the pedal or even freakier will randomly start sewing on its own even if I’m not in the room! I nearly cried on the sewing machine man when he said he had to take it away to the sewing machine hospital! Diagnosis – terminal. Old age. Dicky ticker. Surgery required. Thankfully the little strings of rainbow bunting were already winging their way in the bulging suitcase of a colleague of mine to a country they call Finland. There they will take center stage at the colourful nuptials of a pink-haired lady and her rock star hubby-to-be. It’s actually quite hard not to be joyful day in day out. There’s a lot of pretty things out in the world. Who doesn’t crack open a smile when they see a beaming bride? And who can’t be cheered by fluttering triangles of colourful fabric? 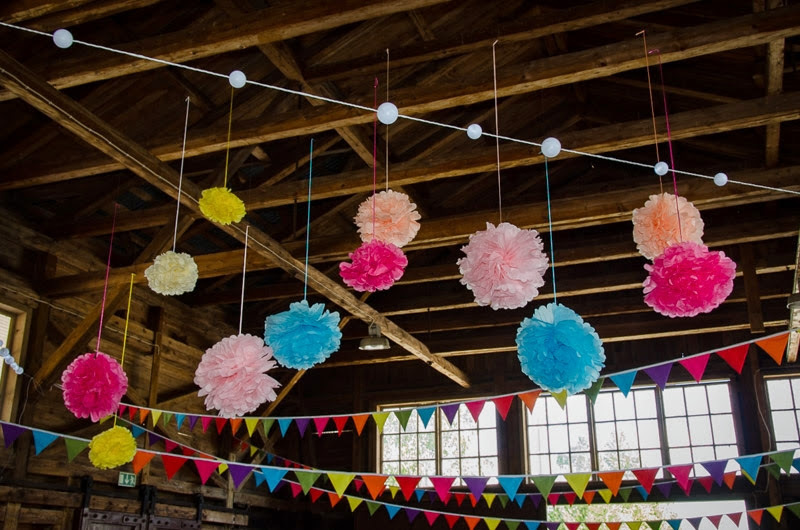 And here’s 80 metres of rainbow bunting up at one Rebellious wedding! Picture: Michelle Middleton. 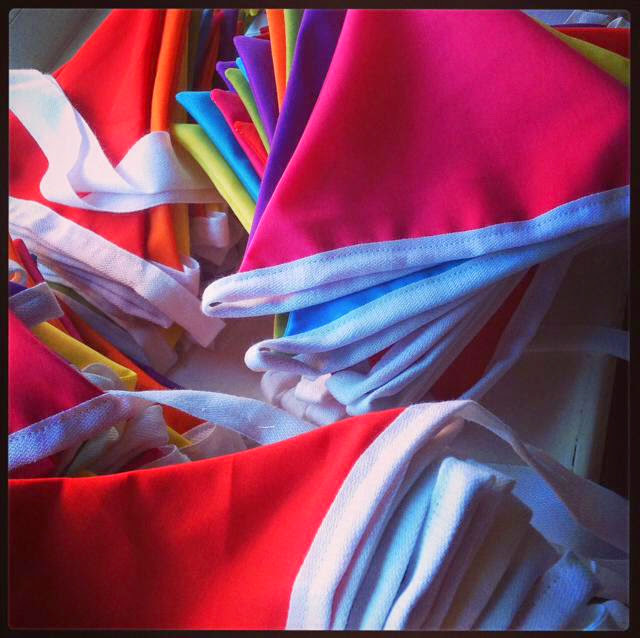 Thank you Lucy for making us – and everyone – smile with your gorgeous bunting.